Hello, I have a question. My new chow chow puppy is a girl, Simba. I know the name doesn't really match the gender, but there was a whole story for me behind it, so please just go with it She is 3 months old, and she is a cream chow chow. so here is my question. I bought her a couple of days ago at a Pet shop, with all the documents, health certificate, passport, ownership papers...etc. when we got home, she refused to eat, and kept drinking water and then having diarrhea only, al day long. I took her to the vet first thing in the morning, and they told me they had to keep her for observation for a few days. It has been 3 days now and she is still there. the doctor is telling me that she had her de worming medicines, but that some could have returned, but they don't know until she poops properly so they can do the tests. This is why people are told to never buy a pet from a pet shop. It is always a possibility there that the puppies didn't get their shots and get diseases like parvovirus, that vaccinated dogs are protected from. That said, it's great that you brought beautiful Simba to the vet. That is where she should be right now, and where she can get the help she needs. I know how hard it is to go about your business while your pet is at the vet's. You worry about your pet all day long and can't really concentrate on anything else. Simba looks good on her foto, all chubby and fluffy, so I'm pretty positive it's nothing too horrible! Please keep us posted on how she's doing!!! I wish her all the luck in the world! your girl looks great on the picture. hopefully it is just something she picked up. My two chows both picked up issues a few weeks after I brought them home. My Simba (male ) is doing very fine now after skin issues and ear infection and Nala is recovering from a bad UTI just great. So if your vet is good, it looks as if you will get back a healthy fluffy Chowling. Congratulations on your new pup. Has your vet did any labs? Please keep us up to date. Good luck. Before I got her, she has been vaccinated once, and she had that medicine against worms. In the passport there is a stamp and confirmation from her previous vet. The poop doesn't have to be solid before lab testing. Vet's generally do this first to help them see if there is anything else going on with the puppy. I feel like by know the vet should have more of a specific dx. How long is he planning on keeping Simba? I don't know. I am 22 years old, so they talk to me as a kid, meaning : not telling me much. the vet's open in an hour, so I will call and insist. Good luck. I know all of us worry about our chowdren if their sick. From what you've stated I just feel like your not getting any specifics from the vet. Keep posting and everyone will try to keep helping you. I know it can be overwhelming and confusing if you've not had to go through this before. tptarica wrote: I don't know. I am 22 years old, so they talk to me as a kid, meaning : not telling me much. the vet's open in an hour, so I will call and insist. You should definitely insist. It's not going to matter to them how old you are when they send you their bill, so they owe you respect now too! Yes, stool samples can be loose. With sick dogs, they are loose most of the time anyway, and of course it can be sent in to be tested. If she's been vaccinated, that would be really great, but there's still the possibility that they just put the stamp in her passport. There are criminals like that, unfortunately. But let's hope for the best!!! The vet told me yesterday that Simba is happy, but again the same thing that she isn't eating. When I asked could he tell me if it is something very serious and concerning ( I meant, is it a serious disease, could she die) he told me that when a puppy won't eat, sure it is something serious. I don't think he understood what I meant. The pet shop is paying the bill, because we have a 1 month warranty on her. The vet also told me to call again tomorrow morning to see if the new therapy they put her on is working. That he wants to give her back to me sane and safe, and before she is, it is better for her to be there. I just hope he is exaggerating and that it is something common and solvable. I don't know at this point. I hate to say this but i think he's milking it for the money. Nothing makes since that he's telling you. If it was me i would go get SImba and observe her at home. It really is doing her no good to be away from you at this point. After you get her home then observe her for yourself, and if you feel something is not right take her to another vet. I really feel from what you've told us that this vet is taking advantage of you. It isn't possible he's taking advantage of me for the money, because I am not the one paying the Vet. The pet shop is. Ok i should have said taking advantage of the pet shop. But it is taking advantage of you also because it has been a week and you still don't have a concrete answer. It is possible he's keeping Simba because he knows the pet store will pay for a month of care. I would go get Simba and bring her home asap tomorrow. This is your pup. Please let me know what happens. I will, first thing tomorrow morning I will go there and figure it out. I can't thank you enough for the support you are giving me. This is the first dog I had on my own. Since I was little my parents bought a St. Bernard, and when he died, 2 golden retrievers, which are still with us. But I live on my own now. and Simba is my first puppy So, in a way it is all kinda new to me. Its fairly normal for a pup not to eat if you have changed the food she is used to...did you ask what food she has been on and continue with that brand? more importantly, did the vet ask that question? My next question would be what is the vet providing, while keeping her for a week, that you couldnt at home? Loose bowel movement would be expected if she's not eating any kibble or fiber source. With only water intake, that's about all you are going to get. You dont say where you are from, but i suspect that others may be right that the vet is seeing a billing opportunity here, regardless of who is footing the bill. At 3 months, there are a series of standard innoculations that the pup should have had or should be having. You may be better served trying to build your relationship with the pup and figuring out her food likes/dislikes on your own unless the vet can provide a specific issue. Chows can be finicky when it comes to food. I would even recommend trying some lure treats and behavior commands just to get something solid into her. The vets office probably wont go to that length. All that being said, the vet needs to give you some explanation. If there is a medical reason, i wouldnt want you to take her out of vet care. That wouldnt be very responsible. The pet shop provided me with the food they have been feeding her so it wouldn't such a change for her, coming to my home. I tried giving her a treat or two but she refused those too. she played with it in her mouth for a minute and then left it there. The vet did not ask me about her food. As far as I know, the have her on IV feeding, maybe you know more than I do about that for puppies. I am a med student, but as far as animals go, I am not that good. I live in Milan , Italy. I study here, but I am originally from Croatia. I really need some advice here. The vet hasn't given me any solid answers, which is why I am doubting him. In my experience, a week in the hospital for a human being is more than enough time to figure out at least the cause of illness. So I'd expect nothing less for a puppy. Do you think I should bring her home? I mean if tomorrow he still doesn't provide me with a good reason for her to stay. I feel a strong urge to agree with the others and to ask you to get her out of there, UNLESS they finally give you some answers as to what they have been doing with her and what progress they have made. When you go to the vet's today, please insist on seeing her!!! Don't let yourself be cowed by them. You have to get a look at her, to see what shape she is in and if she has lost a lot of weight. If she looks horrible, and they still won't tell you anything, take her with you and go see another vet! If they try to make excuses, like, 'the vet doesn't have time to talk to you right now', just smile, sit down and say, 'I have all day'. Refuse to budge until you've achieved what you came for. We are very anxious for news from Simba here! I am soooo happy that you and Simba are back together. Good move on your part for having her checked out for safe measures from another vet. Please don't hesitate to ask questions in the future if you have growing chowdren issues. Lot's of great advice. Take care. good news. glad to hear you can get some bonding time and that she is eating. could possibly have been an adjustment period, but if you got no answers from the vet, hard to say for sure. Like Oceans said, good move to have her evaluated by another vet. 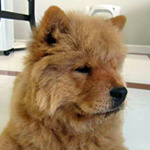 Chows being a timid breed, normally does not immediately trust the new owner with the safety of her food so she does not eat in a day to a max of (I heard from cassie's breeder) one week. CASSIE refused all kinds of food I offered her on her first 24 hours with me, drinking only water. But she got the better of it and decided I am a trustworthy person so she ate,but nibbling at first, then full swing binge on her second day. Her breeder described her the most voracious one among them all. Foods I offered, milk (her milk) , her dog food, chicken morsels, pork morsels. Diarrhea might be a result of Simba's travelling. her vet might be doing the right thing But force feeding the poor pup is something I personally do not approve of. It only traumatizes your chow. She has to be made comfortable around her new surroundings, not subject her to such kind of feeding. Glad to know that Simba finally got a home he can feel comfortable. My Simba always has been a picky eater. He doesn't take any new food for a day, then tries a bit and if it isn't good in his judgement he stops right there until he get's the food he likes. Things got a bit better with Nala, she loves food, (all food) so now he has to protect his portion and mostly finish it, so Nala can't get it. 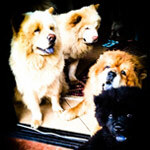 Chows and food can be a difficult story, also in terms of allergies (skin issues). I think most owners agree that wheat products aren't good and so do I. Please check the treats you buy, at least here in the Philippines 99% containing wheat as part of the main ingredients. There is a ton of information in the food section, so check there, and don't be too worried now when it comes to food of Simba. Chows are also masters in picking up on your energy. meaning to say if you put down a bowl of food in front of him being worried he most likely become worried too and refuses the food. 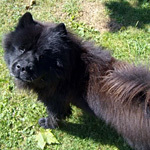 Chows like all other breeds live in the now, he is home and happy now. He doesn't care anymore what happened at the vet. So should your state of mind be now. Take good care of Simba and he will reward you for that in many ways. I was on the edge of my seat reading the exchange of Posts. So glad she is well now. Please read the wealth of information or ask questions about basic Chow care to avoid the avoidable problems that can occur. You can now check the extended stay Veterinarian off your phone list. As a Medical student how do you find the time to be with Simba ? I hope you have someone to be with her when you start the long hours of interning. I'am not a Doctor, but have known Doctors as neighbors and the hours can be grueling. Find a companion (human) who Simba likes and be careful of who they are; Fiat 500 type not red Ferrai slickster. Just an Elders advice.